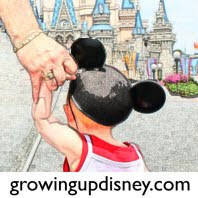 Chris already posted a fun Mickey photo for today's regularly scheduled "Photo Flashback!" 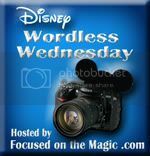 post but I couldn't pass up on today's theme for the Wordless Wednesday blog hop: "Love is in the Air." How beautiful is this??! (And a shy Mickey in the backdrop spells perfection for this theme.) LOVE it! I agree! Amy that is so beautiful. And funny too I love it..
Oh, that is the best !! Fun and romantic!! Love it!!! Thanks so much for sharing your "Love is in the Air!" DWW with us!! Oh my gosh, this is the best!! What a perfect picture for "Love is in the Air!" FabUlous and FUN!!! So very Disney. Love it. What a dream! 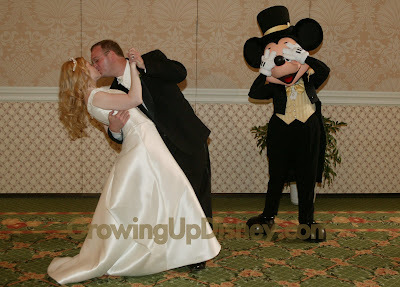 I still wish that we would have gotten married at WDW. Love your picture! Ha! How cute is that... Mickey covering his eyes! Great picture and perfect for this week's theme!